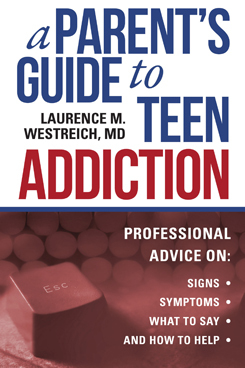 Excerpted with permission from "A Parent's Guide to Teen Addiction" by Laurence M. Westreich. Copyright 2017, Skyhorse Publishing. Available for purchase on Amazon, Barnes & Noble and IndieBound. Sure, we all experience occasional pain—when our tennis elbow acts up, for instance—and sometimes we find it difficult to shed the stresses of our hyper-busy, demanding lives. It’s at times like these that we take an aspirin or drink a glass of wine. Once in a while, though, we need a little extra help, and that’s when our doctors might prescribe an opioid like codeine or a benzodiazepine like Klonopin®. Unfortunately, the very same effects that make these sedatives useful attract teenagers who are in search of a blissful, relaxing high that offers emotional escape. Also unfortunately, teenagers can easily and quickly become addicted to these drugs. Unlike many other substances of abuse, the opioids have legitimate and necessary medical uses, such as pain control after a bone break, easing discomforts during cancer treatments, or relief after a minor surgical procedure. In addition, some of the opioids—buprenorphine (Suboxone®) and methadone—can be used to treat addiction. (Opioids to treat opioid addiction? I’ll get to that later.) Although physicians and dentists often prescribe opioids, many teenagers seek them out by other means because of the sedated sense of well-being and calm—the high—that the drugs can create. However, the opioids carry a very real risk of physical dependence, and misuse can become problematic and even life threatening. Prescription by a doctor is a common route by which many adults become addicted, and teenagers are no less vulnerable to this phenomenon, called “medical addiction.” The teen may be prescribed an opioid for a perfectly reasonable indication, like a broken bone, or after surgery, and then become addicted. A small percentage of human beings prescribed opioids will become addicted, but if your teen is the one, the prevalence in your family is 100 percent! For this reason, teens—or in fact anyone—should be conservative about using opioid medications for even legitimate indications. There are certainly medical situations where opioids are the treatment of choice, but those situations are relatively rare for teenagers. However, most teenagers who get addicted start by experimenting with pills they find in their parents’ medicine cabinet or get from a friend. Addicts lose their ability to stop using the opioids despite very obvious negative consequences, and if they do stop using, they’ll go through withdrawal. A particularly vicious new opioid variant has the street name “Krokodil,” for the brown, ulcerated skin of those who inject this potent and short-acting drug. The anesthetic fentanyl is one hundred times more potent than morphine, and carfentanil is one hundred times more potent than that! When drug dealers cut their heroin with either of these substances, causing opioid-overdose deaths, they—perversely—enhance their own standing in the marketplace because they are evidently selling high-quality merchandise. If your teenager’s using any of the opioids, you’ll probably see a number of side effects. The most marked are lethargy and slowed thinking. If your child falls asleep at dinner or “nods out” while having a conversation, she isn’t just tired: she’s probably high. Although teenagers typically need a lot of sleep, there’s a huge difference between the average teenager and one who’s addicted to opioids. Many parents say that looking back, they realize they noticed signs that their teenager was using opioids, but did not understand them. Use your gut instincts here, and ask the parents of your teenager’s friends whether they notice anything off about her. The opioid-dependent teenager who stops using will suffer a very uncomfortable, but not physically dangerous, withdrawal that brings on anxiety, agitation, a runny nose, insomnia, muscle aches, and diarrhea. One term for withdrawal—“going cold turkey”—comes from the goosebumps that can appear during this process. The really bad part about withdrawal is that the excruciating ordeal often draws users back to the opioids. Your teenager knows exactly how to relieve the discomfort she’s feeling: Get another opioid hit. If she makes it through the short-term withdrawal symptoms, longer-lasting insomnia might kick in. She might not sleep for two, three, or four nights in a row! Again, she knows exactly how to get some heavenly, immediate shut-eye. Withdrawal from the opioids makes relapse so tempting that decisive and quick treatment is essential. WHY DO KIDS USE OPIOIDS? A dose of opioids can produce euphoria, relaxation, and escape from pain, both physical and psychic. Although first-time users of heroin, whether they snort or inject it, often experience nausea, it lasts only briefly and is, for many users, more than compensated for by the pleasurable high. Addicted teenagers talk about gaining the ability to socialize with others, avoid difficult emotional issues, or even do mundane tasks like folding laundry. Of course, those who take too large of a dose become non-responsive or comatose, but new users who take the drug less often describe a blissful sense of transcendence and ease with the world. However, the good part doesn’t last forever. If your teenager becomes addicted to opioids, he needs to take the drugs just to feel normal. He may feel and look relatively unaffected when he’s high, but quite obviously show the signs of withdrawal—sweats, dilated pupils, muscle cramps, diarrhea—when he isn’t. This is one of the most chilling parts of opioid addiction: For your teenager, high becomes the new normal, and he needs the drug to function in ordinary life. Withdrawal from any opioid is uncomfortable and annoying, but usually not dangerous. It can involve intense craving, muscle aches, diarrhea, and impaired thinking, with insomnia that can last for weeks. You can use the torment of withdrawal to get your teenager into treatment, by assuring her that it’s the quickest way to feel better. A detox center or a doctor specially licensed to prescribe a medication called buprenorphine can take the edge off your teenager’s discomfort very quickly and then help her get treatment for her addiction. Offering the carrot of relief to get your teenager into treatment can be a highly effective strategy. Using an opioid medication like methadone or buprenorphine is called Medication Assisted Treatment (MAT): the addicted person is simply prescribed a similar medication, so he does not have to buy illegally, shoot up, or harm himself with adulterated street drugs. Although MAT is not necessarily the first method used for a person addicted to opioids, it does have its place within the armamentarium against opioid use. The maintenance opioid medications, when properly prescribed and monitored, can allow the addicted person to move on with his work, relationships, and physical well-being, in a way that is entirely consistent with good mental and physical health. This is because the maintenance medications are legal, administered orally, and take effect slowly. The effects last long enough so the person taking them does not become intoxicated, and if taken on a daily basis, will not experience withdrawal. I have seen teenagers whose lives have been saved by their use of maintenance medication. They can get off the merry-go-round of buying, using, and selling drugs for long enough to get their lives together. Although the person starting a maintenance program should intend to stay on the medication for at least a year or so, if and when he decides to taper off the medication, that tapering can be managed, so that it causes relatively little discomfort. A common criticism of maintenance treatment is the following: “Maintenance treatment is just replacing one drug with another.” My answer to that is that, yes, of course one drug is being replaced with another, but the drug that is now being used by the addicted teenager causes him no ill effects and allows him to move on with his life. Like all medications, the maintenance medications have benefits and risks. The downside of maintenance medication is that the addicted person then becomes physically dependent on the prescribed medication. However, when weighed against the soul-stealing power of the street opioids, maintenance medications look pretty good. Methadone must be prescribed by a federally licensed clinic or hospital, whereas buprenorphine can be prescribed in an office setting by a specially licensed physician.